Big Idea: Your identity is received from God, not achieved through your efforts. We started our fall series this week, Who Do You Think You Are? 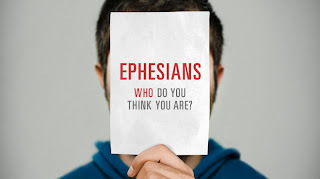 A sermon series on Ephesians. Who you think you are determines how you live. Most of us define ourselves by what we have done or what has been done to us. We relive the mistakes and injustices of our past, or chase the ever-changing expectations of others. When you see who Jesus says you are and what he has done for you, it sets you free to live a new life. When we tie our identity to something, our feelings are also tied to that thing. We were made for God, and our identity is received from Him. It is the identity we were created to have. We were created to know God and be known by God. We are like mirrors, and when we are focused on God, other people see His reflection through us. We have been blessed by God to be a blessing to others. Satan tempts us in many ways to find our identity in something other than God. We either find our identity in Jesus or in idols. We are not defined by our best or worst day. We find definition in Christ.